Local business leaders have teamed up with the University of Arizona Race Track Industry Program in an effort to provide fan education and customer service to turn around a struggling racetrack…and it’s working. Cats must be jealous of Rillito Park. That’s because cats only have nine lives and Rillito Park, the aging track in Tucson, Arizona, seemingly has an unlimited number of lives. The reason for the Rillito revival is because the track is under the management of the Rillito Park Foundation, a group of local business leaders who refuse to let the track ride off into the Arizona sunset. These leaders hired Mike Weiss, a veteran racing executive, to breathe new life into Rillito and show residents of Tucson that there is a new sheriff in town. The savvy Weiss has had extensive experience in track management, but he assuredly is not a miracle worker. He knows that he’s dealing with an old facility and a somewhat apathetic public and he understands that his challenges won’t be overcome in the first season. The 2015 season is just a start. But, oh, what a difference a year makes. The track radiates new life with enhancements across the board. Among the concessionaires is El Charro, a Tucson eatery recently named the most iconic dining establishment in Arizona. Its roots go deep in the community and it offers racing fans a chance to nosh on its burritos, chimichangas, and other Mexican specialties. The business figures are modest by industry standards, but encouraging for Rillito. Southern Arizona’s Hispanic heritage is very much in evident at Rillito as bettors tout horses in Spanish to their amigos and white straw cowboy hats are very much in evidence. They jam together to eyeball the horses before each race outside Rillito’s paddock. One change that Weiss has brought to Rillito is cooperation with the Race Track Industry Program at the University of Arizona, which has been educating future racing executives for more than four decades. A graduate of the program himself, Weiss quickly seized on the gold mine of enthusiastic talent available on the nearby campus. Rillito’s “Desert Duo” handicappers, Aaron Brukman and Randy Olson, are both students in the Race Track Industry Program and they make on-camera picks for racing fans as well as publish a tip sheet.They do more than just give out numbers, they provide into their selections. Olson says he loves the feedback he gets from fans. “We constantly have people coming up to us to thank us for our services,” he says. “Overall, it has been a great experience for us and for all the students. Not only are we able to educate people about horse racing, but we are gaining quality experience that will help us success in the racing industry for years to come. Not surprisingly, the RTIP students working at Rillito have jumped on the social media bandwagon with abandon and Rillito’s presence on Facebook and Twitter is pervasive. That’s a radical departure from last season when the track’s Facebook posts were sporadic and lackluster. Rillito’s administrative positions are filled by many enthusiastic and able Arizona students. The American Quarter Horse is, of course, very much part of the racing culture in the Southwest and sprints for the speedsters are a regular feature at Rillito. Rillito was established in 1943 and is considered the birthplace of Quarter Horse Racing. For a decade, the track was simply a straightaway for sprints, but when Thoroughbred racing was introduced in 1953 a five-eighths-mile track was added. Among the many highlights of this year’s brief meet is a revival of El Mora de Cumpus, a traditional racing rivalry between American and Mexican Quarter horses. The race is legendary in the borderlands of southern Arizona and northern Sonora in Mexico, having inspired both a movie and song. Preliminary legs in El Moro de Cumpus have been contested with a $50,000 est. is slated for March 21. 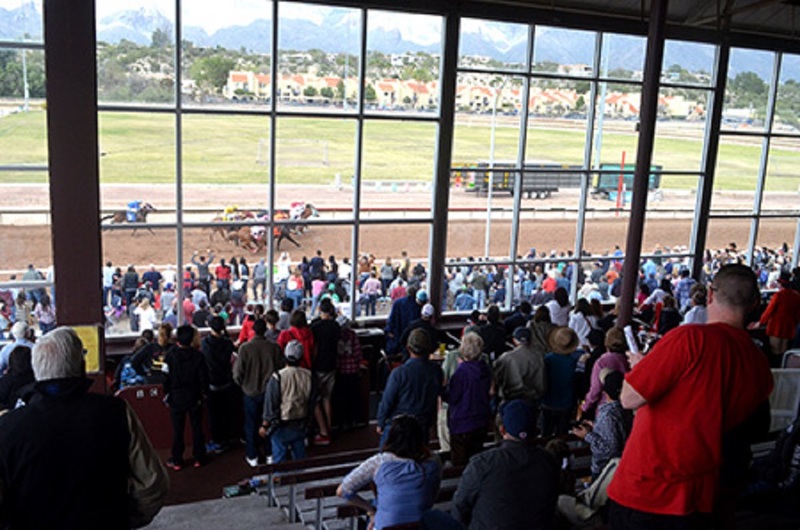 Although the facility is old, the setting at Rillito is one of the best as the racing fans look out over the track to the picturesque Santa Catalina Mountains which provide an impressive backdrop for the drama on the track. When the last horse crosses the finish line at Rillito in another month, plans for the Derby Day celebration will begin, as will plans for Rillito’s 2016 season. Dean A. Hoffman was Executive Editor of Hoof Beats magazine, official publication of the U.S. Trotting Association, for 25 years and is a member of the Harness Racing Hall of Fame Communicators Corner. He is a past president of American Horse Publications and now is an instructor in the Race Track Industry Program at the University of Arizona.